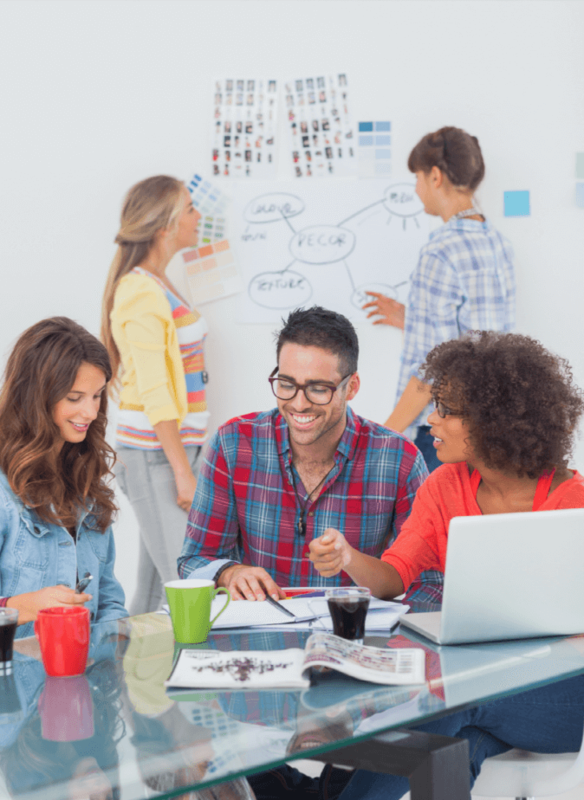 Home » Case study » Refreshing Website Meta Titles Helps SEO? Many blog posts and forum threads all over the Internet have created (and some of them prove) the notion that Google prefers fresh content. In fact – the fresher, the better. But since the creation of new content means a lot of work, and small-business owners don’t usually have the time to deal with it on a regular basis, we decided to find a shortcut and test the limits of Google’s algorithm. Some authors suggest that by changing only the webpage’s title would make it look a lot more appealing to Google and apparently is a huge timesaver instead of writing a whole new article. There were eight websites, created for the purpose, that were divided into two groups of four. Group A got their titles changed periodically, and Group B was a control group where nothing changed. We used it to see if any algorithm changes would occur during the experiment. At first, we changed titles weekly, but after the second change, we had to expand the time period between two changes because nothing seemed to happen over the course of a week after the change had been made. Therefore, for the last two changes, we included exact match keywords in the titles. 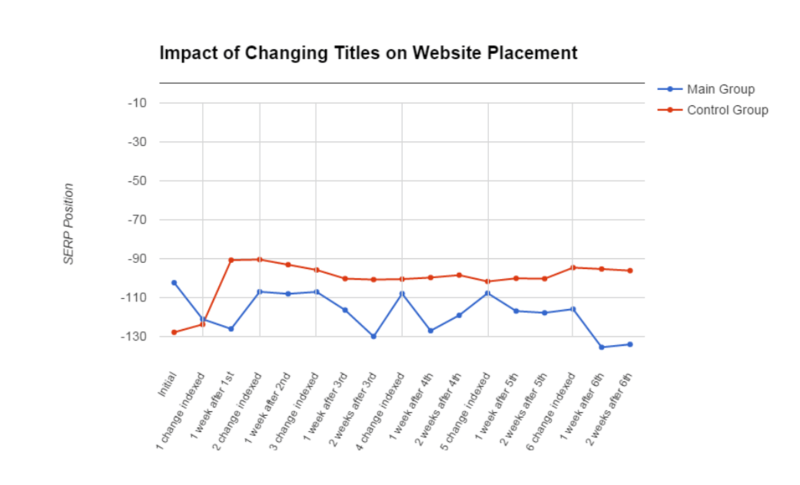 Website placement is the most important metric in this experiment. 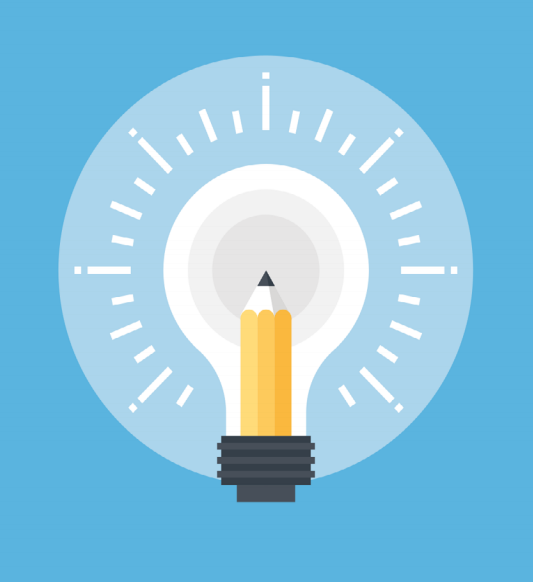 Placement was tracked on the day the page was indexed, and after that – once a week. We weren’t sure what to expect in terms of how soon results will be visible (if ever) so we figured it out along the way. At first, we changed titles every two weeks, then we switched to a 3-week period. The time for indexation was dropped as a KPI soon after the experiment began because we found an effective way to control when a page is indexed – through Google Search Console. The big slopes during the first weeks are a result of not waiting long enough for websites to reach stable positions after being indexed. So we consider the second change of titles as the real start of the experiment. The control group showed no significant fluctuations in their average placement, so it’s safe to say that the observed events in the main group are a result of our actions, rather than a result of algo changes. It is quite apparent that websites reach their highest SERP positions right after the new titles get indexed (marked with grey lines). However, they don’t keep the better placement. Within a week or two, their rankings dropped to where they started from. In some cases they even got lower. During the 7th change of titles, we modified the experiment by focusing all titles around a single keyphrase. Again we saw a quick boost right after indexing the titles. The control group experienced a bit of an overall improvement of rankings at the end of the experiment but still doesn’t seem that the main group gain was influenced by that. which starts with the 7th change. Let’s take a closer look at the placement of the websites for the particular exact match keyword – see the 7th and 8th changes of titles. The rankings experienced insignificant deviations until a week after the 8th change. After the 8th change, two of the websites dropped out of the first 20 SERPs and didn’t quite recover until the end of the experiment. Being aware of Google’s guidelines, there is a great chance that those titles actually hurt rankings, so they should be avoided. The tested method of optimization can be used for achieving a quick but short-lived boost of placement. 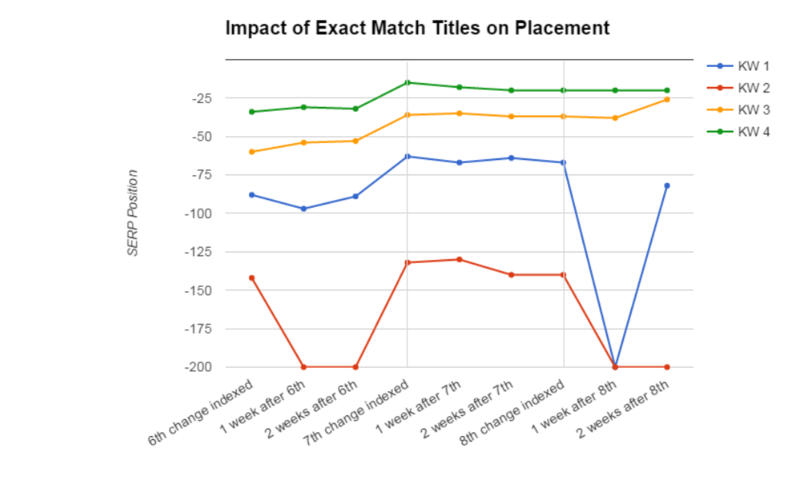 If a longterm effect is sought after, titles will have to be changed every 3-4 days. The sites in the experiment were freshly published and this might have influenced the scale of the boost. We suspect that a bigger site with stronger SERP positions might get better results in terms of positions gained and the duration of the positive effect. 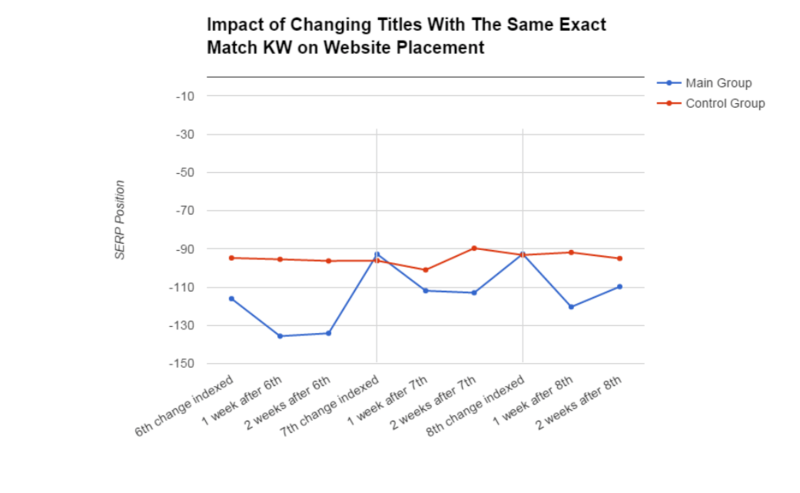 If all titles are focused around the same exact match keyphrase, it won’t help improve rankings and might even result in losing positions.